celebrating and promoting their digital sisters by tweeting about their businesses, wisdom, creativity, blogs, Facebook pages, causes, videos, and web sites. I created #DigitalSisterhood Wednesdays during the 2010 Blogalicious Weekend Conference and launched the weekly Twitter celebration to give women in social media a weekly opportunity to build and strengthen their communities. Each week women are encouraged to celebrate and promote their digital sisters by using the #FF (Friday Follow) format. This weekly celebration gave birth to Digital Sisterhood Month and the Digital Sisterhood Network in December. One of the lessons I learned during Digital Sisterhood Month was that Digital Sisterhood is more than a weekly or month-long celebration. It is a movement that has a life of its own. It is living and breathing on and offline. Did you know Digital Sisterhood traveled with me when I left Washington, DC and landed in Port-au-Prince, Haiti on February 25? I had no idea she packed herself in my luggage with plans for developing digital sisterhood bonds with 11 amazing women I met through the Heart of Haiti campaign. See the list of digital sisters below. 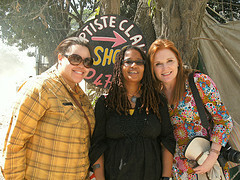 Click here to see more photos of the Heart of Haiti‘s Digital Sisterhood. Heather Whaling, PR/Social Media Expert and President of Geben Communication. I learned so much about these ladies in four days. 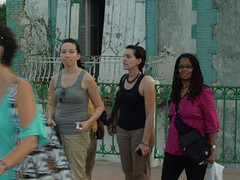 We talked about many issues as we toured Port-au-Prince. Stories, insights, reflections, and lessons learned danced in and out of our daily adventures. Laughter, silent pauses, a reflection and prayer circle, yoga before sunrise, Reiki healing touch sessions, blogging and tweeting in the hotel restaurant, filming video interviews, taking photos everyplace we stopped, late night girl weekend conversations, dancing and eating plantains at Jacmel’s Carnival, and chit chatting at the cafe in Toussaint Louverture International Airport are just a few of the ways Digital Sisterhood created bonds between me and these women. 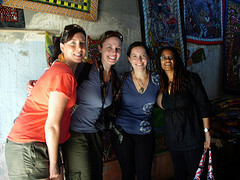 It’s hard for me to fully describe the Digital Sisterhood bond that happened in Haiti. I guess I am still basking in the beauty and blessing of connecting with 11 dynamic women. 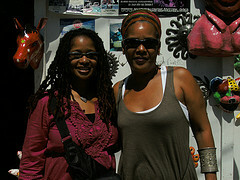 So I will leave you with two of my favorite Kreyol words and video interviews of Willa Shalit and Heather Whaling. 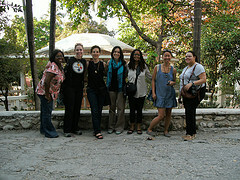 The Heart of Haiti Digital Sisterhood is “belle bagay” (a Kreyol word that means fabulous)!